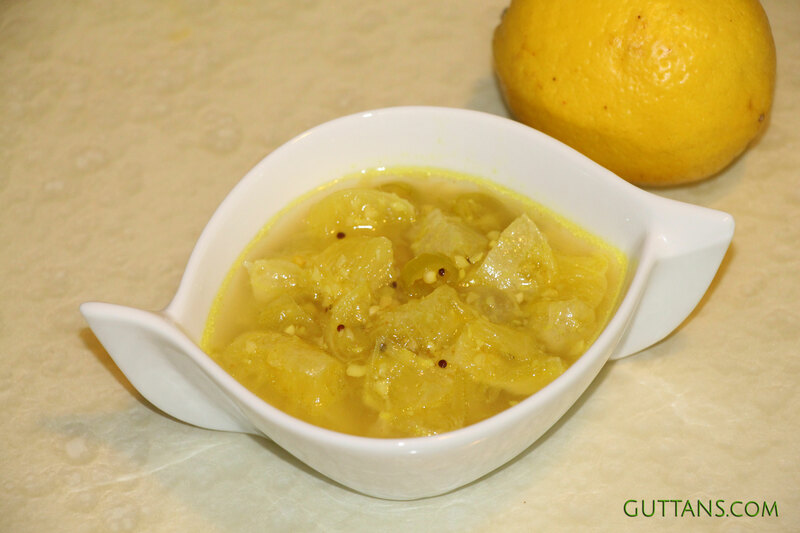 Vadukapuli­­­ Naranga Achar or Wild Lemon Pickle is very easy to make. Vadukapuli­­­ Naranga Achar is simple, spicy and tangy one. Pickle is made using Curry Naranga or Vadukapuli Naranga or Wild Lemon which is bigger in size and is more juicy and sour compared to small yellow limes. Vadukapuli Naranga Achar or Vella Naranga Achar is one of the pickles served on banana leaf during traditional Kerala Sadya as a side dish during Onam and Vishu. It is also called as Naranga Curry in some parts of Kerala. Vadukapuli Naranga (Wild Lemon) gives the authentic taste to sadya. Vadukapuli Naranga Achar is mostly served along with pradhaman (sweet dessert) during feast. Prepping : Peel lemon, carefully remove white pith and cut lemon into small pieces. Pith is the white spongy layer between the fruit and the peel, and it has a very bitter taste. So make sure to remove the white pith completely. Slice green chillies into small round pieces, finely chop garlic and ginger. Heat gingelly oil in a pan and splutter mustard seeds. Add curry leaves, ginger, garlic and green chilli and saute well. Add turmeric powder, fenugreek powder and asafoetida powder. Now add the cubed lemon pieces and saute for a while. Remove it from the stove top and transfer this to a glass container. Vertical glass jar is good as the water needs to cover all lemon pieces. Boil water with 2 tsp salt. Pour this hot boiling water over the lemon mix. Stir well. Add more salt if needed. Cover and keep aside. Keep outside for two to three days for the flavors to set in and then refrigerate the pickle. The longer you keep pickles sealed and stored in a cool, dry place the better they taste. Longer they are allowed to blend in with the spices the more they absorb flavors and taste better.